Week 16 of the Cosmopolitan Soccer League’s 2nd Division sees another 4 Southern teams playing exclusively at Randall’s Island with eyes set on climbing up the table this Sunday. NY Ukrainians will play against Panatha USA on Field 74 and FC Japan faces Hoboken FC 1912 on Field 75 this Sunday on April 21st, 2018. While we’ve written plenty on Hoboken FC’s record in the league, locking their sights on promotion, the most exciting matchups this time around might be against the remaining 3 teams all looking for the 3 points going into the end of April. On the back of a successful quarter-final in the Harry J. Saunders Cup, NY Ukrainians’ reserve side will play against Metro Division 2 side, Kelmendi FC NY for the cup semi-finals. The Manhattan-based club may use this as a bit of inspiration going into their match against Panatha USA. While not exactly free falling, they haven’t been soaring either. They have 2 wins, 2 draws and 7 losses in their last 11 matches. Their last win was back in November of 2017 when they saw off visitors Beyond FC 2-0 on a chilly afternoon at McCarren Park. They would then go home with a point with Wiliiamsburg International FC, a 6-goal thriller of a draw a week later. Ukrainians Manager Steve Kovalenko hasn’t got to much to worry with in his opposition who are much deeper down the table - Panatha USA currently 2nd to last place in the South with a record of 2 wins, 1 draw and 9 loss in 12 matches. The team is stacked with talent and could win this encounter but they can not afford to fall further away from playoff contingency. Panatha USA finished 7th in the Southern 2nd Division last season. With the worst goal difference in the entire Division 2, they might finish in the same position they’re currently in now or even worse. The green-clad Greeks have a quite the mountain to climb to improve this season. They haven’t seem to find a good run of form and are leaking goals with the worst defense in the league, allowing 50 goals and scored 12 in 12 matches. The last time Panatha USA played against NY Ukrainians, they lost 3-0 back in October of 2017. They are looking to reverse the final score this time against the Ukrainians with a win on Sunday. Hoboken FC 1912 have notched another win against the aforementioned Panatha USA with a 7-1 demolition. What could be the winning formula this time around? Coach Marco Chung kept it short and simple. If it ain’t broke, no need to fix it and Hoboken seem to be riding high off the momentum every match without changing a thing. With a Corey Chaplin hat-trick, a Thomas Hogue brace and goals from Jeremy Witherspoon and Jeff Natale, the goals are appearing from all over the pitch without any need of a dramatic squad rotation. “I don't see any changes in our 11...” said Chung. “Promotion has been our goal since the beginning of the season and every day the players are getting better and better with more confidence in their game.” Chaplin maintains his Golden Boot form as top scorer in the Cosmo League 2nd Division with 17. They seem to be unstoppable, with Polonia Gwardia NY being the only team they have yet to win against. With 8 wins, 2 draws and a single loss, drawing 2-2 with Hoboken the first time around, it seems that they are their biggest opponents allowing one less goal than the New Jersey side, being the best defense in the Division. They have one more chance to face them in their last match of the season on the 20th of May 2018. 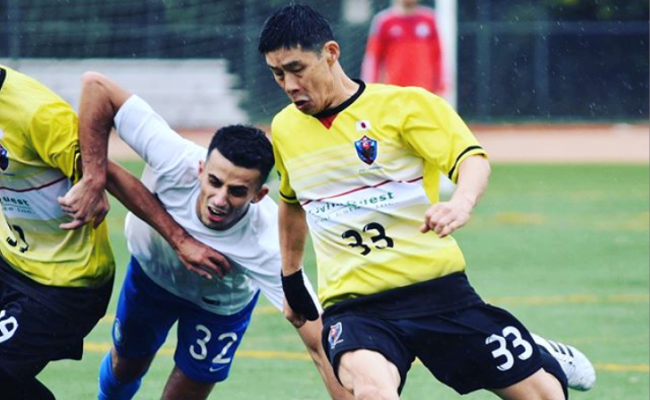 FC Japan, Hoboken’s next opponents on Sunday, haven’t been so fortunate. They are rock bottom of the league and with their reserve side yet to collect a point in the 2nd Reserve Division, it’s tough being a FC Japan supporter. And yet, they haven’t given up on the league. And they don’t look like giving up either. They are a team who are looking to improve game by game in order to assure that they can still compete with the very best in the Cosmopolitan Soccer League. FC Japan’s official website elegantly wrote a philosophy that accurately describes how the team thinks. While their defense is very shaky and needs improvement, they have found the back of the net before. Their top scorer is Kenji Nakamura with 6 in 11 games. They’ve only went 2 game goalless, in a 3-0 loss to Club Deportivo Iberia and a 9-0 loss against Hoboken in New Jersey. With Hoboken away from home, a strong and confident winning performance isn’t a stretch considering their opposition is 6 points clear at the top and might not have to worry about losing 3 points away.